If the Diaspora could have a summit with the brightest minds, most skilled hands, and strongest bodies…developing the most brilliant strategies, producing at the highest levels of innovation, executing in excellence under immense pressures, and replicating the blueprint for the next generation … we would call it Leadership Wakanda. So we did just that. It’s going down on Feb 24th and we. can’t. wait. I put out the call and my “tribe” answered from villages near and far. We’re taking a select group of 100 teens from all walks of life to journey to the Kingdom of Wakanda. 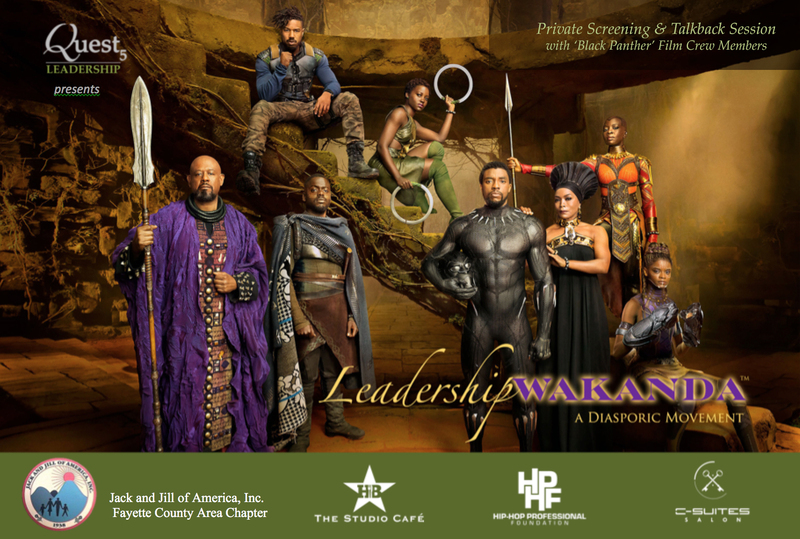 This is a cinematic teen leadership experience that will begin with approximately 100 teens (and their chaperones) attending a private screening of the highly anticipated, blockbuster movie, ‘Black Panther’, at Cinemark Tinseltown 17 theatres in Fayetteville, GA. We will then convene for a meal and panel discussion at Hanna Brothers Studio Café located at Pinewood Atlanta Studios Production Centre in Fayetteville. The Talkback Session will be the perfect outlet for us to unleash our thoughts and emotions around the film. Ten ‘Black Panther’ crew members from Visual Effects, Stunts, Hair, and Costume Design will lead a discussion on their behind-the-scenes experience of working on this history-making project… the power of story… and HOW to mobilize “superpowers” (gifts, talents, and skills) to create an EPIC production on set, on-screen, and beyond in our everyday lives. Fifty of the invited teens (our ‘VIP guests’) were selected from nonprofit organizations that serve vulnerable youth and their families, including economically disadvantaged households and children in foster care. We are asking our friends in the community to help us deliver an AMAZING experience for them by sponsoring 1 or more of our ‘VIP’ Teens. The cost per teen is $40, which includes theatre admission, concession snacks, talkback session, and a hot buffet meal. If you, your family, or organization would like to make a donation (of ANY amount) to sponsor teens from the nonprofit organizations, please visit our event page here: http://bit.ly/2nImQiz. Select “Tickets” and scroll down in the ticketing list to see all of the donation categories. We are serving teens from the Multi-Agency Alliance for Children and AVPride. Our strategic objectives are to enlarge their capacity to dream; inspire them to go/do/be more; and charge them to lead their own movements right where they are planted. None of us will be the same after this experience… nor should we be. This movie is really more than a 2hr-14min escape into Marvel’s universe. It marks a mass awakening of the Diaspora and an opportunity to mobilize our forces to create our desired future RIGHT NOW. It’s so important for youth to know that we can co-create and build real kingdoms and empires together. We should take inventory of our collective assets and capitalize on opportunities to build beyond our individual capacities. I love the African proverb: “If you want to go fast, go alone. If you want to go far, go together.” This was my philosophy when I launched my first business in 1998. It’s a truth that still guides me today. Over the course of 20 years as an entrepreneur and developer of people, I’ve been able to create jobs, launch careers, directly advise over 500 entrepreneurs, and seed business ventures for family, friends, and associates that I’ve met along the way. For me, Leadership Wakanda is an opportunity to roll all of my expertise and relationships into a transfromational experience that’s bigger than me and what I can do alone. I appreciate the support of my village and welcome the support from the larger tribe that I am building. The Diaspora is awakening and the movement has already begun. I am BEYOND excited for the journey these young people will have the opportunity to take…as part of the Marvel/Wakanda experience!! I have NO doubt they will all walk away with a new sense of identify, power and sonship! It was awesome! Highlights to come.